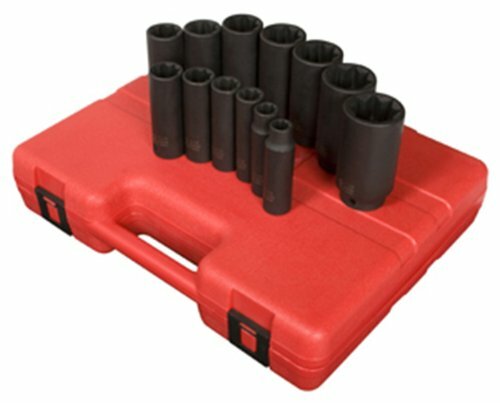 This Sunex 1/2 inch drive deep 13 piece 8 point SAE impact socket set includes the most common sizes used for automotive repair. Made of CR-MO alloy steel for long life, it is fully guaranteed and includes a heavy duty blow molded storage case. Set includes 13 SAE (inches): 3/8, 7/16, 1/2, 9/16, 5/8, 11/16, 3/4, 13/16, 7/8, 15/16, 1, 1-1/16, 1-1/8.